Renowned Physicist Freeman Dyson: “Theories Of Climate Are Very Confused”…”Models Are Wrong”! Browse: Home / 2018 / November / 16 / Renowned Physicist Freeman Dyson: “Theories Of Climate Are Very Confused”…”Models Are Wrong”! In his new documentary “The Uncertainty has Settled“, Dutch filmmaker Marijn Poels focuses on climate science and politics and found that the issue is in fact as controversial and as UNSETTLED as any issue could possibly get. The science climate change is far from settled and is in fact unsettled. The production of the film took Poels to a variety of locations from Manhattan to the Austrian Alps. The first part of the film depicts the plight of farmers in former East Germany (Saxony Anhalt), who are struggling to practice their livelihoods under the heavy burden of German agricultural regulation and market distortion that result from bureaucrats having decided that 0.01% of our atmosphere (man-emitted CO2) is a monumental problem. That’s the narrative the media and leading politicians keep ramming. But a number of skeptics doubt it, and so Poels investigates if this doubt is just right wind politics or if there is something really behind it. In the end he finds that the science is fully in dispute. At the 38:00 Poels says that the [alarmist] Potsdam Institute refused to grant him an interview and so he set out for Hamburg to meet with climate scientist Hans von Storch, who is in the warmist camp. Von Storch confirms that climate change is real, man-made and is a problem that needs to be dealt with seriously. But he adds that the claim that we can “rescue” the climate is “nonsense” and characterizes the claim the individual can play a role on controlling climate as “enormously egocentric”. Later in the film (1:04:45) von Storch says he doesn’t see climate change as a danger, but as “a challenge” that he is not afraid of. Next astrophysicist Piers Corbyn tells Poels that the amount of man-made Co2 in the atmosphere is like a “tiny blob of birdshit” and calls the claim that this is causing the climate to change “complete, delusional nonsense”. Corbyn also believes the globe will see continued cooling until about 2035. He calls the datasets showing warming “frauds”. Next Poels makes his way to Princeton where he meets with “living legend” Princeton physicist Freeman Dyson, one of the leading skeptic voices on man-made climate change. The 93-year old Princeton professor also notes that although the models are “very good tools for understanding climate”, they are a “very bad tool for predicting climate” and that these scientists “live by scaring the public”. He also told Poels a large sociological part of the problem is that climate scientists have in large part gotten caught in herd and tribal mentality. Carbon dioxide, at 410 PPMV, is around 0.04 percent of the atmosphere. If it were a whole one percent, its effect would still be nil. Look up the science, including QM solar radiation effects yourself. There are many weaknesses in the AGW orthodoxy, but this is not one of them. Your argument is far too general and would imply that no substance present in concentrations of the order of 400 ppm could have much effect on anything. Yet there are numerous instances in science and technology ranging from medicine to microelectronics where the exact opposite is true. Many medicines are prescribed in doses in which the active ingredient is expressed in milligrams, or even micrograms, when the typical bodyweight of an adult is of the order of tens of kilograms, or, if you prefer, when the weight of the bloodstream is of the order of 5kg. I, myself, am largely kept alive by a medicine whose concentration in my bloodstream is around one hundredth of that of CO2 in the atmosphere. If we could only get impurities in silicon down to the order of 400 ppm, then modern microelectronics would become downright impossible. We have to do orders of magnitude better than this in order to make it work at all. Most amusingly, we already know that CO2 in its current concentrations has a truly vital effect on our environment. If there were no atmospheric CO2, there could be no photosynthesis; without photosynthesis there would be no vegetation and without vegetation there would be no animals. Given all this, I can see no a priori reason why we should dismiss out of hand any putative effect of trace substances. Each individual candidate has to be treated on its own particular merits. The idea that climate scientists are ignorant of how much CO2 is in the atmosphere is ludicrous. So, why doesn’t this faze them? The answer is that their theory is quantitative and although, in the absence of feedbacks, it would only account for 30-40% of the warming, they invoke positive feedbacks to make up the difference. To me, this looks like a fiddle factor, but that is a different story. Finally, the theory says that what matters is where in the atmosphere, the number of GHG molecules per unit volume lies within a fairly narrow critical range. Provided there are enough of them, the number of other molecules present is largely irrelevant. It is therefore misleading to discuss the effect in terms of ppm. Provided there are enough of them, the number of other molecules present is largely irrelevant. It is therefore misleading to discuss the effect in terms of ppm. So can we assume you agree that the proponents of dangerous AGW should be far more concerned and focused on eliminating methane emissions from farm animals than CO2 emissions from humams since methane is said to be 86 times more potent than CO2 in causing global warming? Based on your comments, the traceness of a trace gas is “irrelevant” in determining its potency. So the fact that methane makes up 0.00017 of the atmosphere’s gases (1.7 ppm) compared to CO2’s 0.041 (410 ppm) is immaterial, right? To me, what matters is not how much of any supposed GHG there is in the atmosphere but by how much it CHANGES. This is important when we come to consider any possible effects of oxygen and nitrogen on global warming/climate change. So far as I am aware, the amount of nitrogen in the atmosphere has not changed significantly, so even if it were the most effective GHG known to man, its effect on climate change would be near zero. When we come to consider the effect of oxygen, we note that the amount of it in the atmosphere has probably declined. Where else does the burning of fossil fuels producing CO2 get its oxygen from? This means that any effect of oxygen on climate change is likely to be a COOLING. Of course, there could be some outgassing from the oceans resulting from rising temperatures which would affect the amount of N2 and O2 in the atmosphere. However, this would be a feedback and not a primary effect. The amount of warming/cooling that we would expect from any change in any particular GHG will be the product of some measure of its effectiveness and the amount by which it changes. The effectiveness is largely driven by where, in the overall electromagnetic spectrum, its absorption bands lie. If this is in part of the spectrum where the earth emits very little energy then its effectiveness will be low. On the other hand, if it is in a region where the earth emits a lot of energy, its effectiveness will be high. Water vapour, CO2 and methane all fall nicely into this particular slot, whereas oxygen and nitrogen do not. This ought to be enough to debunk Blair Macdonald’s “paper” which was the subject of a previous blog. As for the relative effects of CO2 and methane on global warming, I don’t actually know by how much the amount of methane in the atmosphere has changed. This means that I am unable to answer your question. As for the relative effects of CO2 and methane on global warming, I don’t actually know by how much the amount of methane in the atmosphere has changed. It’s claimed to have risen by a factor of 2.5 since industrialization, from 0.000072 to 0.00018 (I forgot it was adjusted up from 0.00017). 86 times more potent than CO2. 2.5 times more prevalent than it was a few hundred years ago. Should we be looking at farm animal regulations more than CO2 mitigation, or is the traceness level of CH4 still small enough that we need to stay focused on CO2? But I’m curious… Since you’re a skeptic, and the heat energy change from global warming is expressed as a change in ocean heat content/temperature primarily (93%, with a change of 0.02 C since 1994), and as a change in surface/air temperatures negligibly (1%, see this comment for reference), are you aware of any quantified real-world measurements for how much of a change in ocean temperatures is caused by a, say, 10 ppm change in CO2? I’ve been asking dangerous AGW advocates for real-world physical measurements of the amount of change that atmospheric CO2 changes elicit in ocean water (or any water body, for that matter), and they cannot produce any. Assuming you can’t produce any either, do you think the question as to whether a 0.00001 (10 ppm) change in CO2 causes a heat change of 0.001K or 0.000000000001 K is the fundamental question with GHG-induced global warming? Why is it that we don’t have any real-world measurements of CO2’s effect on water temperatures, but we are nonetheless here debating the merits of trace gases as a climate factor? Do you agree that we need these measurements to determine the extent to which CO2 affects climate? “If there were no atmospheric CO2, there could be no photosynthesis; without photosynthesis there would be no vegetation and without vegetation there would be no animals. Keep in mind that plants ACTIVELY remove CO2 from the atmosphere via photosynthesis, which is an enzymatic process. It wouldn’t occur at all without the proteins that facilitate it. It’s just not a valid comparison at all. The fundamental difference between atmospheric gases and trace additives in compounds is that the atmospheric gases are a mixture whilst the compounds have undergone chemical change. Medicines with trace elements are such because much of the mixture is used merely as a carrier to transfer the active ingredient which on it’s own would be too small a pill or too small a fluid to be manageable. This turns out not to be the case. Most of the CO2 that plants consume is actually dissolved in the water they absorb through their roots. Photosynthesis occurs in the leaves, regardless of how the CO2 gets there. And (no CO2 in the atmosphere = no CO2 in the soil), so yes it is the case, and the plant would still starve if atmospheric CO2 were reduced below about 150 ppm. BTW: What’s the source for your claim that “Most of the CO2 that plants consume is actually dissolved in the water they absorb through their roots?” From what I can find, you appear to be way too far out on a limb with that assertion. I would think that if your claim were true, they would be aware of it. They don’t even mention that in their discussion of the response of roots to higher atmospheric CO2. Regardless, the fact that plants can benefit from such a tiny amount of CO2, and small increases in it’s concentration, is because of enzymatic activity, not the power of CO2 by itself. Your comparison of a biological trigger reagent to a bulk process reagent is false. The comparison of your medication to your body weight and functions is similar to this comparison of my car. I have a car which weighs around 2,000 kilograms (2 million grams). It starts with a key that weighs around 20 grams. So the mass of the key is about 10ppm compared to the mass of the car. As long as it activates the switch, the mass of the key whether it weighed 2gm, or 200,000gm it wouldn’t make any difference. The medications you take are not effecting the bulk chemistry of your blood. The meds are keys which affect the function of proteins within the cells of your body. Likewise the air we breath is around 20% oxygen and 80% nitrogen. One or two percent variation either way doesn’t matter. However a small amount of cyanide (CN) will kill us within a matter of seconds. Cyanide binds to the oxygen receptors of our blood hemoglobin preventing the binding of oxygen to the hemoglobin. Professor Dyson is one of the top physicists alive. If he thinks climate models are rubbish, people need to take notice. This on Zero Hedge a day ago. It would be poetic Schadenfreude to see a rapid cooling. I would smile to see the alarmists eating crow. But the rational part of me doesn’t want any cooling. Warm periods have been referred to as ‘Climate Optima’. They are in general conducive to economic and environmental happiness. There is something I don’t get. I think I remember reading that about 17% of IR is not absorbed and escapes unhindered. Water vapor is able to absorb all of the wavelengths that make up the remaining 83%. CO2 is able to absorb at the wavelengths emitted at a temp of about -80 celsius which is not a lot of energy. But given water vapor’s ability why does CO2 make any difference? If you reduced CO2 to zero water vapor would just absorb the energy instead. If increased CO2 absorbs more energy, isn’t it just stealing from water vapor? So increasing or decreasing CO2 would make no difference as it is not additive to energy absorption. Am I wrong? 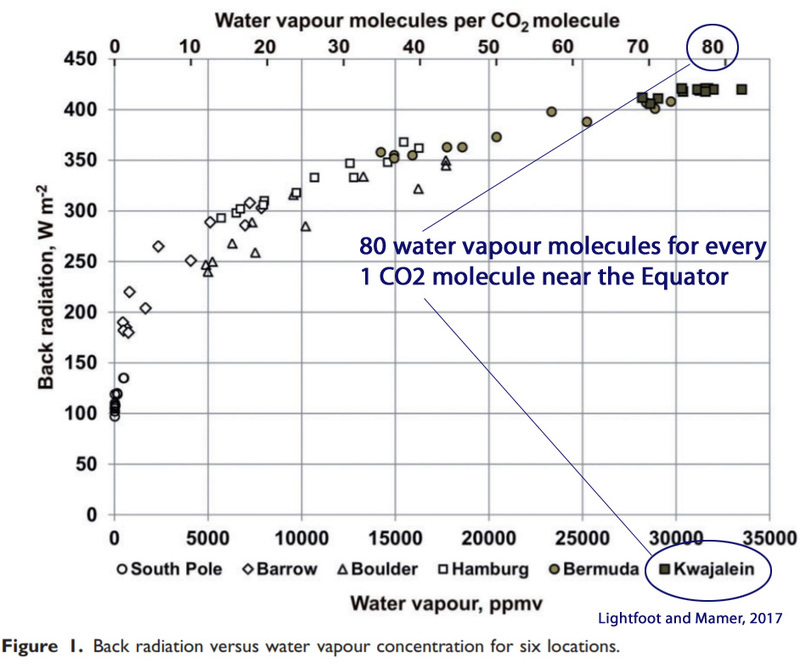 But given water vapor’s ability why does CO2 make any difference? If you reduced CO2 to zero water vapor would just absorb the energy instead. If increased CO2 absorbs more energy, isn’t it just stealing from water vapor? So increasing or decreasing CO2 would make no difference as it is not additive to energy absorption. Although I agree with you that it is largely ocean heat content that matters in the VERY LONG TERM, we need to remember that it is the near surface air temperatures that AGW theory and the models based on them attempt to explain/predict. We should therefore use the observations that come nearest to this near surface air temperature to test the theory and the models. In practice this probably means some sort of average between the surface measurements and the satellite measures of TLT. Of course, some of the heat generated by whatever is causing the surface warming will leak away into the ocean depths. However, I am not aware of any predictions as to how rapidly this will occur. If whatever is causing the warming were to be suddenly switched off, then surface temperatures would eventually return to something nearer the pre-industrial normal. However, this could take a very long time! The nearest that I can come to assessing the likely relative effects of CO2 and CH4 on such surface temperatures is to use the idea of “CO2 equivalence” to be found in the various rcp scenarios used for the CMIP5 models. On this basis, I note that the CO2 logarithm increases slightly more than the CO2 equivalent logarithm over the period 1800 – 1999. This would suggest that CO2 is a significantly more important factor. I am reluctant to use such data for any more recent changes since at some point between 2000 and 2008 we move from (pseudo?) measurements to guesswork. Finally, of course I agree with you that we need both more, as well as more accurate, measurements to determine the extent to which CO2 affects climate. Note: you asked me a question but the reply function to your post appears to be missing. The nearest that I can come to assessing the likely relative effects of CO2 and CH4 on such surface temperatures is to use the idea of “CO2 equivalence” to be found in the various rcp scenarios used for the CMIP5 models. On this basis, I note that the CO2 logarithm increases slightly more than the CO2 equivalent logarithm over the period 1800 – 1999. This would suggest that CO2 is a significantly more important factor. Those models are essentially the opinions of the gatekeepers dressed up in scientifically-sounding nomenclature. The reason why CH4 is downplayed relative to CO2 despite its alleged 250% increase since industrialization relative to CO2’s <50% increase is likely because they realize that regulating animal flatulence is not something they can oversee like they can fossil fuel energy production and consumption. Water vapor is by far the more potent GHG relative to CO2, and its prevalence in the atmosphere ranges between 1,000 (poles) and 40,000 ppm (tropics). And without even considering its relative abundance (compared to CO2), when water is present at IR absorption bands, it almost completely overwhelms any effect that CO2 may have. And yet the IPCC models insist that water vapor, despite its prevalence and potency that far outweighs CO2, is merely a feedback. Why? Probably because the UN cannot sign treaties to regulate water. All this to say that your original contention — we should not dismiss trace gases and their potential to influence just as we shouldn’t dismiss the trace levels of ingested chemicals for the human body — is indeed not an especially strong point. The traceness of gas does matter. The potency of a gas to deliver what it’s claimed to does matter. As someone else wrote here, chemicals put into the body are not well-mixed. They can independently have an effect. In the atmosphere, all the molecules are mixed together, meaning that the molecules that affect IR the most can overwhelm and render negligible the molecules that have weak effects or that are trace. So there is indeed something to the statement that CO2 only represents 0.04% of the atmosphere’s gases. I’m sure you realize that we cannot arbitrarily assume that any point in earth’s temperature-history is the “normal” one; indeed, viewed over the long term, large variations are the norm. I do agree w you that there is entirely too much argumentation that minuteness of quantity or percentage invalidates the CO2/Warming hypothesis. The evaluation must include its mode of action. That, of course, is the point of departure between you & Kenneth. I wd therefore have liked to have seen the exchange more sharply focussed on the mode of action of CO2. It is 6 degrees F now, the record is 68 degrees F on this date, happened in 2001, and the record low is minus 10, which happened in 1959. The total amount of coal burned in one year is now amounting to 7.2 billion tons. In 1895, the amount burned in England was 200 million tons. The carbon dioxide in the air was at 280 ppm then. When CO2 is reduced to 180 ppm using a controlled atmosphere, plants begin to suffer, ambient CO2 is not enough at that concentration. You can spike the CO2 in a greenhouse using an alcohol burner. Your home probably has a concentration of 1000 ppm inside. You exhale one kg of CO2 each day, it sticks around. Dare I mention the fact that Mr Corbyn quoted above has a socialist brother who is leader of the Looney party in Britain. If his party wins power they have determined to reduce plant food Co2 back down to pre industrial revolution levels, i.e. 280ppm or some such daft levels. Politicians lie for a living. Corbyn would very soon change his tack on reducing atmospheric CO2 were he elected as PM. He’s jumping on the climate bandwagon to gain green votes.